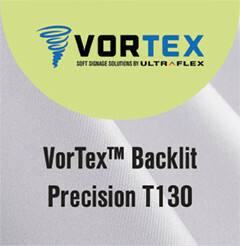 VorTexTM Backlit Precision T130 is a polyester fabric ideal for use with retail applications. Designed and coated to hold a high resolution and wide color gamut. Unique coating that prevents color distortion due to cracking if the fabric is creased. Print surface allows for rich and uniform saturation resulting in vivid back-lit graphics through transfer dye-sublimation printing. Available in 63” and 126” widths.